A new optical modem, capable of sending high-definition quality video significantly faster than standard radio frequency systems, is being developed for NASA's Orion spacecraft. The hardware, offered by LGS Innovations, is expected to deliver near real time footage from the moon and other space destinations. Given that radio waves and light both propagate in vacuum at the speed of light, all communications between spacecraft and ground controllers is delayed when it comes to distant space missions. While it takes about 2.5 seconds to send data to the moon and back, the delay grows to several minutes in the case of Mars, and could reach even hours on missions to other planets. While laser communications would not reduce the propagation time delay, it could be used to significantly increase the amount of data that can be transferred at once, revolutionizing future space exploration efforts. It can transmit data over long distances at rates up to one hundred times greater than radio frequency systems. The Herndon, Virginia-based company LGS Innovations, is currently developing the necessary hardware to make such high-speed communications available for the upcoming Exploration Mission-2 (EM-2). 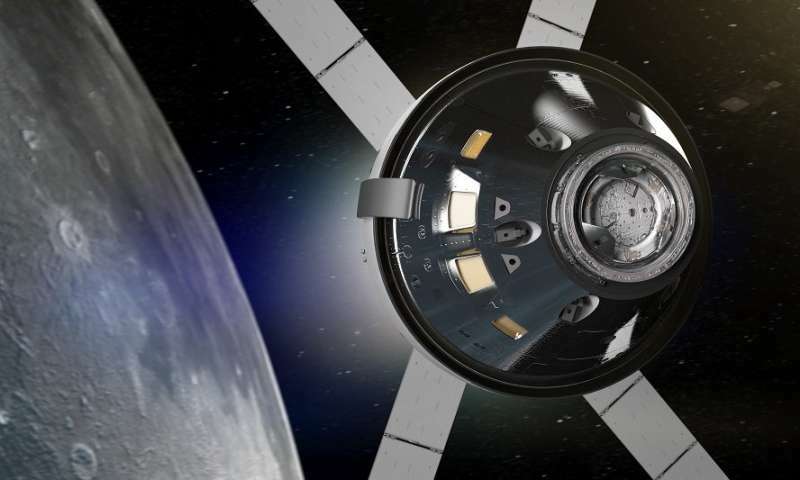 The mission, scheduled for 2023, is planned to be the first crewed flight of NASA's Orion spacecraft, during which astronauts will make a fly-by of the moon. LGS Innovations will provide an optical modem that will enable broadband data communications to and from the Orion vehicle. "The Orion optical modem will be central to providing broadband communication services when NASA next sends astronauts to the vicinity of the moon. We are proud to support the agency's mission and drive the evolution of photonics technology," Linda Braun, Senior Vice President of Photonics Solutions at LGS Innovations, told Astrowatch.net. "Future exploration missions, both manned and unmanned, will require high bandwidth communication links to ground stations on Earth to support advanced scientific instruments, high definition video, and high-resolution imagery. This is one of three NASA's optical communications projects that we were selected for to help the space agency meet the ever-increasing requirements for more bandwidth and faster connections," Braun said. She noted that by increasing data transmission rates by many times over conventional means, optical technology in general will enable a wider range of future scientific inquiry than is currently possible. Hence, this technology is being considered also for the International Space Station (ISS), exploration of deep space asteroids, as well as for commercial satellite communications applications. "Laser communications could almost totally reduce that delay, revolutionizing future space exploration efforts. It can transmit data over long distances at rates up to one hundred times faster than radio frequency systems. The technology would therefore allow a near real time communications for lunar missions." 100 times faster than the speed of light? Really? How is that? The author of this article has confused the time lag in communications over large distances (due to the finite speed of light) and the difficulties of communication speeds (i.e. bit rates) which are also limited over large distances (this time by technology). I think phys.org should take a careful look at this contributor. OK, I went over to their website...and their 'explanations' are shockingly childish. And no, they don't say the signal travels faster (although the kiddie-speak on there almost seems to want to suggest it). Only that they have more bandwith using a laser (Duh). To be charitable, if you include the title of the article into the substance of the article, I think the author - who may have been somehow debilitated when writing it - meant to state that you could transfer an HD movie back to earth 100 times faster with lasers than radio. But one of the worst written articles ever on this site, no doubt. Looks like the article has been at least partially rewritten. That's fun. Who the hell did they have write the initial copy?